I was recently invited to a small event at the large psychiatric hospital in our area. You all know that I work a lot with Time To Change, but this year, I'll be collaborating with NTW on many different projects (there'll be another post about that). NTW (in case you don't know) is Northumberland, Tyne and Wear; one of the largest mental health NHS Trusts. The pledge signing was held in a conference room at the hospital and I was so relieved when I spotted four people I knew! The first little speech came from Associate Director, Nigel Campbell from Rethink (one of the two organisations involved with Time To Change. He began by telling us that they now had over 300 businesses and organisations who had pledged to do all that they can in tackling mental health stigma; the organisations varied from Rolls Royce to universities and government departments. Nigel described these organisations as 'forward thinking' and that they were pledging their dedication to the belief that stigma is not acceptable. 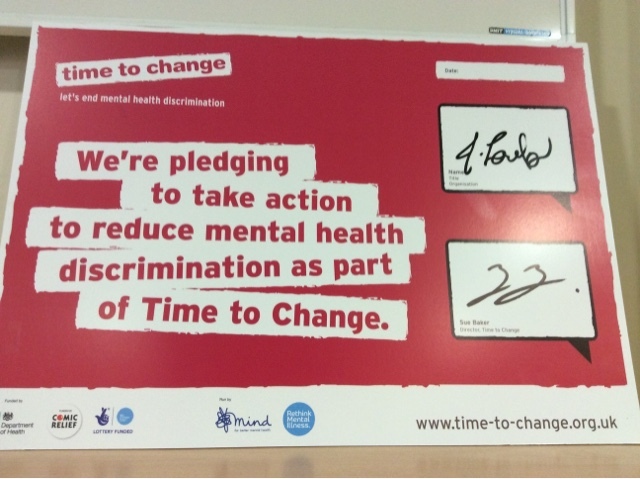 He then went on to discuss that Time To Change's work is driven and shaped by those who use mental health services in order to reflect on the interactions between the two. We then heard from a service user who was also a qualified mental health nurse (I can't publish her name but let's call her S), and had experienced mental illness in her mid teens yet was only diagnosed at the age of 47, with Bi-Polar. She said that after struggling for so long the diagnosis didn't shock but she had to take 3 months off work when she most poorly. In returning to work she had to decide whether she would tell them about her diagnosis; her husband who worked in management advised her not to. He worried that it would hinder her career and affect her chances of any promotions or pay rises. However, S felt that her work was valuable and beneficial for her wellbeing, and so she opened up about her mental health. S found some problems when she requested extra shifts and Occupational Health had to give her the OK so it took a long time; but reflecting on it, she was able to understand that her colleagues weren't familiar with working with someone who has a mental health condition. S wanted to instill in her colleagues that she was still the same person now that she had a diagnosis, but felt that she often had to prove that she was well. She talked about once you have a diagnosis like this, everyone will assume that if you have a bad day then you're poorly again - something I've experienced too. S finished with saying that she felt choosing to speak out is individual to each person and there is no right or wrong decision in doing so, but she hoped that by speaking out, it might encourage others to. Next, Lisa Rodrigues, CBE and voluntary chair of the project's working group, voiced her personal experiences in mental ill health. She began experiencing difficulty with her mental health at 15 and after attempting suicide she experienced being badly treat by a nurse. Lisa had been told she was a 'waste of space,' she was taking the nurse away from helping 'more poorly patients' and that she had been selfish in attempting to kill herself. I found this interesting because I have also been met with all of those comments and completely agreed when she said people who self-harm etc, will already be feeling those things about themselves, and so there is no need for others to make such spiteful remarks. Lisa found Cognitive Behaviour Therapy helpful as it helped her notice her problems and then do something about them. Finally, my good friend and CEO of NTW, John Lawlor, made the closing speech. He briefly mentioned how own experience with mental health that took the form of depression, and went on to talk about his experience of applying for a new job. He'd received a call from someone he named as a reference and they told him that they didn't think the potential new employer should know about John's depression and refused to include it in his reference. John went on to discuss an example of why he was signing the pledge; he'd once spoken to a service user on a ward and they'd said that you can tell who are the patients because the staff have their own cups. He pointed out that something like this, that might seem so trivial but it's a example of how such simple things can leave deep seated feelings that shouldn't be underestimated. 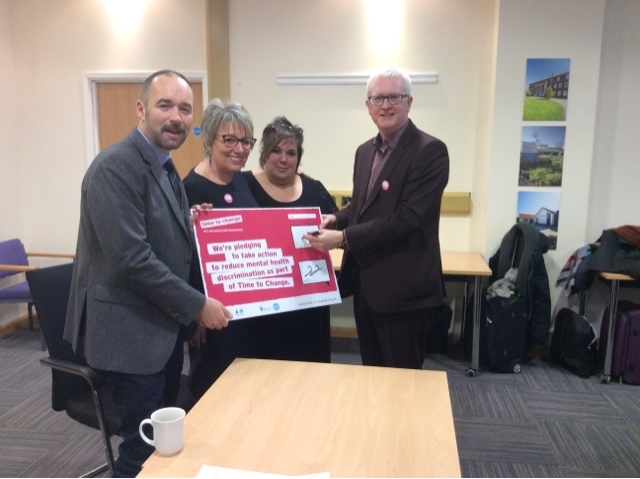 John hopes that in signing the pledge it will help improve services to become aware that they might get it wrong in interactions with service users, but that judging and criticising are not the best way to change and improve things. And, there'll be an entire post out soon about all of the projects and collaborations that I'm NOT Disordered will be doing in partnership with NTW NHS. Trust me; it's VERY exciting!